Advancing the health of a community disproportionately burdened by chronic disease and economic hardship poses challenges and opportunities. 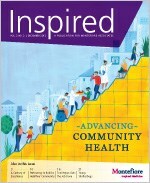 The latest issue of Inspired focuses on Montefiore's commitment to the Bronx community and how we work with the community to reduce obesity, diabetes, heart disease, cancer and promote healthy living. Montefiore associates strive to reach people where they live, work and go to school, and dedicate themselves to delivering traditional clinical services in non-traditional ways. We want to hear from you! Email us and tell us what you find inspirational about working at Montefiore. Your stories could appear in an upcoming issue.